[miau] There are a lot of unlikely entertainment-themed ideas for slot games. But you should never confuse the strangeness of the theme with the overall playability of the game. The slot game built around a “Wizard of Oz” theme is pretty creepy, but it’s also one of the best games in the market. The Osbournes – for those people who don’t know – are the family of rocker Ozzy Osbourne and they had a successful reality series that spawned a new TV career for the entire family. The game uses drawings of the family as the theme and for some of the reel symbols, which is a bit of a problem since the drawings look as if they were drawn by a drunken robot. The game is a non-progressive, 5 reel setup, 20 paylines and has a maximum payout of 75,000. Which means that it’s in the mid-range for playability and payouts, but still well worth trying. The game play itself is pretty straight-forward. You select the amount of the bet, the number of paylines and the number of coins per line. Then it’s time to go gambling with rock and roll’s best known family. The reel symbols are mostly Osbourne-themed, with headshots of Ozzy, Sharon, Jack, Kelly and even the little yappy dog Mimi. There are also images of music-related items such as mic stands, awards and guitars. There is also a wild symbol shaped like the Osbournes logo that helps create additional winning combinations. There are several bonus features in the game, including the scatter feature Mimi, which randomly shows up during play. Mimi barks away and as she does, your possibility of winning increases, up to a ten times bonus. There is also a Grab & Gift bonus round, which comes up randomly and gives you the chance to win items from one of the family member’s secret stash. It’s a chance to really win big, even though you never know quite when it’s going to pop up. 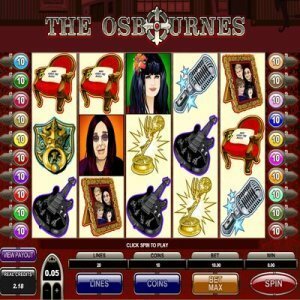 At the end of the day, “The Osbournes” is a fun game to play and you do have the possibility of winning big. It’s an oddly-themed game and while the rock & roll elements are fun, the images are just distracting. Which, now that I think about it, also is a pretty good description of the real life family.